Can a person imagine a state on the earth which should be ideal in all respect, where all living beings have been endwoed with auspicious qualities; where people would be completely satisfied and full of bliss; where there would be no trace of greed and lust in anyone; where no one would have to bear any kind of suffering of this material world? Probably one may come to this conclusion after conceiving all the above criteria that these all things are possible in the kingdom of God only. Yes, these all things are possible in the rule of supreme personality only. So where to find such a state on earth! Now rein the horses of imagination and have a look on the words of Valmiki-Ramayana (the first documented history and the biography of supreme personality) that once such kingdom existed on earth when Shri Rama, the supreme personality of godhead himself ruled the entire earth as a virtous ideal king. Ram-Rajya (the kingdom of Lord Rama) have been such a state in history where all such completely unbelievable things happened when Shri Ram ascended on the throne of Ayodhya as king of entire earth and started ruling the earth as per Dharma of highest order. Śrī Rāma-Rājyam is synonym to 'the kingdom of God' or 'Dharma-Rajyam by Shri Rama' (the rule of Dharma). The rule of supreme personality of godhead, Shri Rama shone on the earth with all aspects. Shri Ram-Rajyam symbolises the ideal society without any crime and war & endowed with all auspicious qualities, the state of peace, prosperity, justice & equality to common man, and complete well-being of the subjects of the state in all aspects etc. Lord Ram’s legacy still rules the hearts of Indian people and inspires politicians of the world. Śrī Rāma has been a role model for everyone be it a common man or even a king or ruling class of some state. As an ideal state, Rām-Rājya, has been attracting people, kings in past, and also present politicians. Mahatma-Gandhi always visioned the establishment of Rama-Rajya to be done after independence of India in 1947. There is an extremely elegant description of Shri Ram-Rajya in Shrimad Valmiki-Ramayana as well as in other scriptures too. As Shriman Valmiki Ramayana is the self-sufficient authority in all spiritual matters, so we would see the description from there by sage Valmiki contemporary to Lord Shri Rama. As supreme personality of godhead and the supreme controller of all the worlds, Shri Rama stills rules the earth indirectly, but it was the auspicious effect of Rama's rule in personal that all the people became intent on virtue and completely satisfied. So only those people can get ultimate peace, pleasure, prosperity and bliss of Rama-RAjya who feel and see that Rama is the king of all the worlds and take refuge in his lotus feet with all love and devotion. While in direct rule of Shri RAma as king of Ayodhya, everyone was blessed with all auspicious qualities, Dharma (righteousness), peace, prosperity, complete satisfaction, and bliss. The world was bereft of thieves and robberies. No one felt worthless nor did old people perform obsequies concerning youngsters. Every creature felt pleased! Every one was intent on virtue! Turning their eyes towards Shri Rama alone, creatures did not kill one another. Not just only Human being but every creature felt pleased in Shri RAma-RAjya. All were intent on virtue. Not just Human-Beings or deities or demons, but even trees, beasts, birds, etc, all were engrossed in looking at Shri Rama alone! See the greatness of Rama's kingship that everyone survived for thousand (1000) Years without any illness and grief. None of the three fold agony of this material would could touch anyone while Shri Rama was ruling this earth. The world was transformed into Shri Rama's world. No one was interested in any other thing apart from their King Rama who was very embodiment of righteousness (Dharma). Such a description of the supremely excellent kingdom of Shri Rama free from all kind of miseries, and endowed with pure Dharma (righteousness), ultimate peace, great prosperity, and hence submerged in complete satisfaction and bliss, can't be found else where apart from Shri Rama-Rajya. Many incarnations have ruled this earth, many prophets have ruled their kingdoms, but no one could achieve the greatness of Shri RAma-Rajya. No one can't produce any other example from the vast history other than the greatness of Rama-RAjya. Rama-Rajya should be the role model for all the nations on the earth. So be intent on virtue (Dharma) and take refuge of Shri Rama by complete surrender, if a nation wants its complete well-being. How many years did shri Rama rule on this earth? Shri Rama ruled this earth as a King for eleven thousand (11,000) Years. Here the words रामो राज्यम् उपासित्वा (Ramo Rajyam Upaasitva) means 'Rama, on reverencing the kingdom' have very depth meaning and these words give complete idea and picturisation of the Rama-Rajya, How Shri Rama was treating his subjects, How and in which way Shri Rama ruled his kingdom. From these words of sage Narada, it can be easily understood that Shri Rama didn't rule his kingdom as just like a King rather he worshipped and served it as like a devotee. 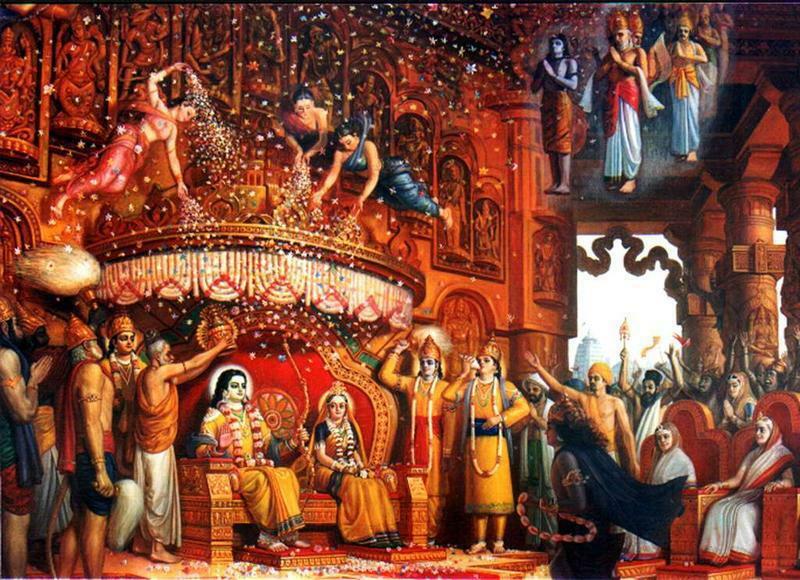 Being a virtous & ideal King, Shri Rama idolised his kingdom and he served it as his deity. He served his subjects as like a father takes care of his children. Shri Rama showed how to give the best governance to a nation, how to win the hearts of common people from the rule of Dharma. So after reading the description of Rama-Rajya, anyone can understand why Indian people still talks about Ram Rajya in present day and age. Shri Rama is still the king of entire earth in the mind and heart of the Indian people. He is the only personality who deserves to be famous. same thing has been reiterated in Uttar-Kanda of Valmiki Ramayana that Lord Rama ruled the earth for 11000 years (eleven thousand years). The Lord of Ayodhya, Lord Rama will rule the earth for a long time and all those who follow Him will be happy and prosperous. Shri Rama after ruling the earth for eleven thousand years, will proceed to Brahmalokam (Saket-loka, the world of Brahman). Hence from above verses it is clear that Shri Ram ruled the entire earth for eleven thousand (11,000) Years. All glories to Lord Shri Rama and His kingship!! !